CONVAL® offers extensive calculation options for components and processes in the process industry. Proven procedures according to DIN, VDI, VDMA EN/ISO standards or ISA, ASME, API, etc. are used as a basis. This ensures that the right calculation basis is always available, even in international projects. CONVAL® guarantees flexible and professional use through absolute independence from device manufacturers, without having to forego specific manufacturer data. The range of calculations offered extends from control valves, throttle devices, thermometer protection tubes / thermowells, piping calculations to heat exchangers or pumps. 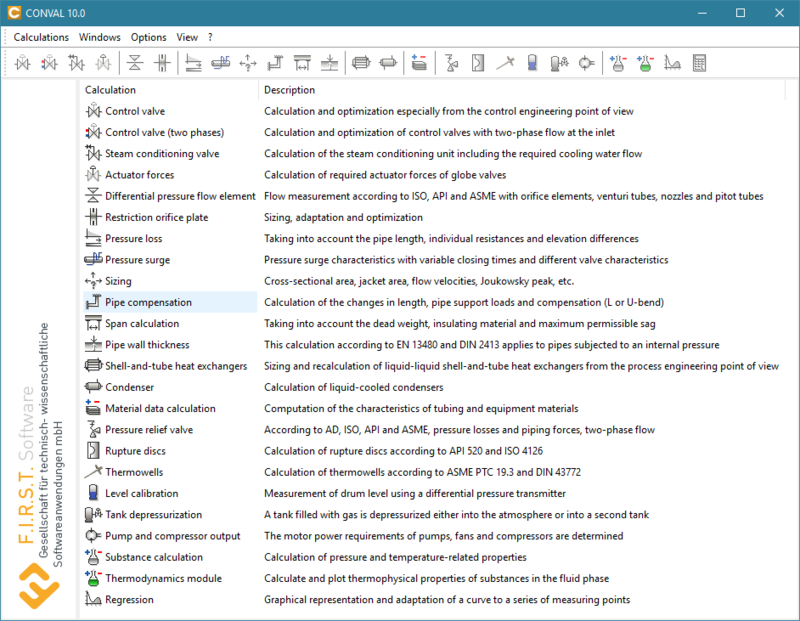 Integrated property data calculation (property database, thermodynamics) and extensive databases for actuators, safety valves, flowmeters, media, materials etc. are part of the software package. CONVAL® thus covers process engineering requirements such as instrumentation in FEED projects as well as basic & detail engineering, maintenance or plant expansion.